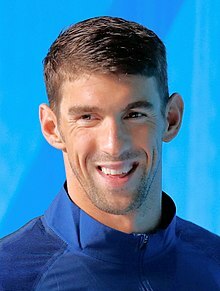 Michael Fred Phelps II (born June 30, 1985) is an American swimmer who holds world records in several events. Phelps won eight medals at the 2004 Summer Olympics in Athens. Six of those were gold. These medals made him tie the record for medals at a single Olympics. Alexander Dityatin has held this record since 1980. In 2008, Phelps won eight swimming gold medals at the Summer Olympics in Beijing. This broke Mark Spitz's record for most gold medals in a single Olympics. Spitz had won seven gold medals at the 1972 Summer Olympics. At the 2012 Summer Olympics in London, Phelps won another four gold and two silver medals. At the 2016 Summer Olympics in Rio de Janeiro, Phelps won five gold medals and one silver. In total he has won 28 Olympic medals, a record. 23 of these are gold medals, over two times as many as the former record. Phelps is also known as the most decorated olympian in any sport. Currently, Michael Phelps has retired. He will not be back for the Tokyo 2020 Olympic Games. Phelps was diagnosed with attention-deficit hyperactivity disorder (ADHD) when he was nine. Michael Phelps poses for a photo with U.S. President George W. Bush after Phelps won his first Olympic gold medal in 2008 in the men's 400 meter individual medley. ↑ Harris, Nick (August 11, 2008). "'Baltimore Bullet' has history in his sights". The Independent. London. Archived from the original on August 25, 2010. Retrieved August 25, 2010. ↑ "'Flying Fish' Phelps largely unknown in China". MSNBC. August 17, 2008. Retrieved April 21, 2012. ↑ "USA Swimming bio: Michael Phelps". USA Swimming. Archived from the original on April 5, 2012. Retrieved August 25, 2010. ↑ "Michael Phelps". London2012.com. Archived from the original on January 23, 2013. Retrieved August 1, 2012. ↑ "Phelps passes Spitz". Associated Press. August 17, 2008. ↑ "Phelps claims first Beijing gold". BBC. August 10, 2008. ↑ "Phelps wins second gold in relay". BBC. August 11, 2008. ↑ "Third gold for unstoppable Phelps". BBC. August 12, 2008. ↑ 11.0 11.1 "Phelps breaks Olympic gold record". BBC. August 13, 2008. ↑ "Sixth gold for unstoppable Phelps". BBC. August 15, 2008. ↑ "Phelps equals Spitz's seven golds". BBC. August 16, 2008. ↑ ""Men's 4 x 100m Medley Relay -- Final"". Archived from the original on August 20, 2008. . Beijing 2008. August 16, 2008. This page was last changed on 7 February 2019, at 17:07.